Boulou Ferre (left) and his brother, Elios, have been playing Manouche style jazz from childhood. Heavily influence by their father, Boulou began playing professionally at the age of 12. 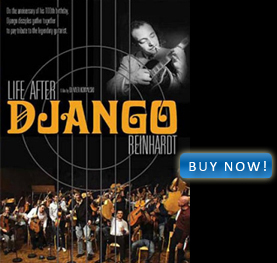 Featured in the documentary, Life After Django Reinhardt directed by Olivier Kowalski. 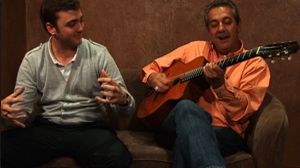 David Reinhardt (left) is the grandson of the legendary jazz guitarist, Django Reinhardt. Shown here with Django follower and renowned guitarist in his own right, Romane, featured in the documentary, Life After Django Reinhardt directed by Olivier Kowalski. Tchavolo Schmitt, a renowned Romani gypsy guitarist was introduced to the guitar by his mother at age 6. Although he toured with several groups in the 1970s, it wasn't until 200 0 that he began to release albums under his own name. 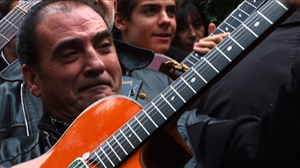 Featured in the documentary Life After Django Reinhardt directed by Olivier Kowalski. The "Django 100" in studio practicing for the Centennial World Tour. Featured in the documentary Life After Django Reinhardt directed by Oliver Kowalski. 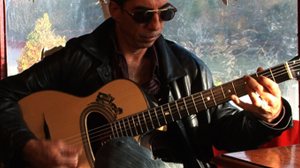 Angelo Debarre started playing the guitar at the age of 8 and in 1984, started his first group, Angelo Debarre Quintet. 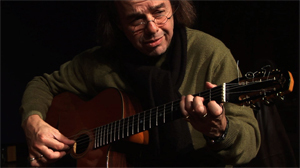 Debarre has performed in several significant Romani and jazz festivals, particularly "Birdland's Django Festival" and recorded Mémoires: Memories of Django with Tchavolo Schmitt, both of whom are featured in the documentary Life After Django Reinhardt directed by Oliver Kowalski. 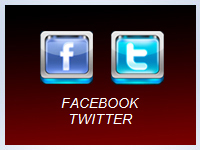 Download the attached zip folder for high res and low res images.